We’ve launched three new TV and Monitor stands – the Mobile TV and Monitor Stand on Wheels and the Portable TV Stand which are both portable stands on castor wheels. And the XL 60 Free Standing TV Stand which is static and can be used either freestanding or integrated with a pop up display. This monitor stand is a portable solution for mounting both TVs and monitors up to 60” in size or approximately 45kg in weight. This stand is especially useful for conference calls due to the adjustable video tray on the top of the frame. The stand supports VESA standard from 100x100mm to 600x400mm, making it compatible with a wide range of monitors and TVs. An adjustable plastic shelf is included with an approximate load bearing weight of 4.5kg when evenly spread, this is ideal for storing components, accessories or a laptop. An integrated cable management system is also included which allows cables to be hidden, creating a clutter-free and professional appearance. The monitor itself is height adjustable between 1030mm and 1530mm (measured from the floor to the screen centre) due to an innovative 2” incremental spring design. This allows for effortless setup to your ideal viewing level. The portable TV stand is stylish, freestanding and can be used to mount both TVs and monitors. The heavy duty, easy glide castors make it highly portable and easy to manoeuvre around your location. 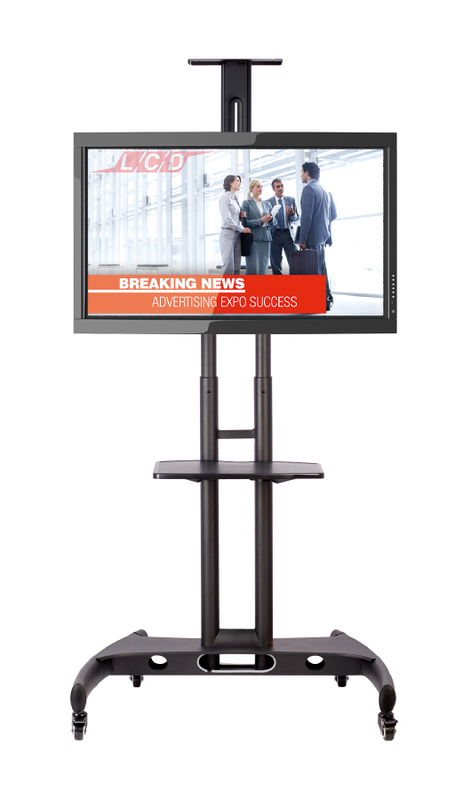 The TV stand is ideal for displaying marketing media in high traffic locations such as in reception areas and at events. Promotional video can be displayed giving visitors a better understanding of your product or service. 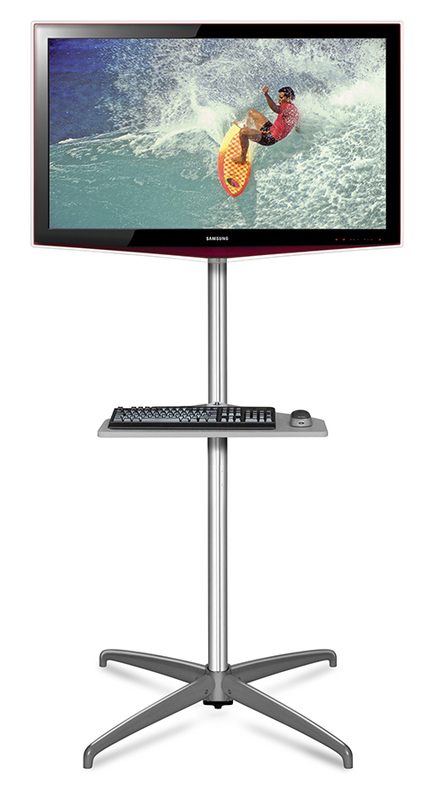 This stand supports LCD and LED screens between 32” and 55” in size and up to 40kg in weight. The height adjustable shelf included is ideal for holding a keyboard or laptop and has a load bearing weight of approximately 5kg. Similar to the Mobile TV and Monitor Stand on Wheels, the Portable TV stand features a cable management system which allows you to keep a clean and professional appearance. The XL 60 Free Standing TV Stand is slightly different to the other two in that it doesn’t feature castor feet and so is a static TV stand. The stand is suitable for mounting TVs and monitors that are up to 60” in size or a maximum of 42kg in weight. A unique feature of the XL 60 Free Standing TV Stand is that it can also be integrated into our pop up displays, creating a stylish exhibition display that engages with your attendees through the use of promotional audio visual content. The monitor stand sits behind the pop up with two of the feet coming through the front of the graphics. We can custom finish your graphics to accommodate the TV stand and give a seamless look to your printed display. For more information on this process, please contact us on 01733 511030. The VESA standard mount supports from 200x200mm up to 400x600mm. The monitor bracket is also height adjustable between four different heights – 1600mm, 1700mm, 1800mm and 1900mm. The stand has two options available – a three part pole which packs away into a single bag, or a single pole which is packed away into two bags. The single pole is close to 2m in length, however it is easier to assemble than the three part pole. An optional keyboard shelf is also available which can be adjusted both horizontally and vertically to suit your standing position if using a keyboard or laptop. The load bearing weight of the shelf is approximately 10kg when evenly distributed and a separate carry bag is included which allows for easy transport and storage. Our monitor stand work well in conjunction with a range of our other products, including pop up displays, iPad display stands, roller banners and promotional table cloths. 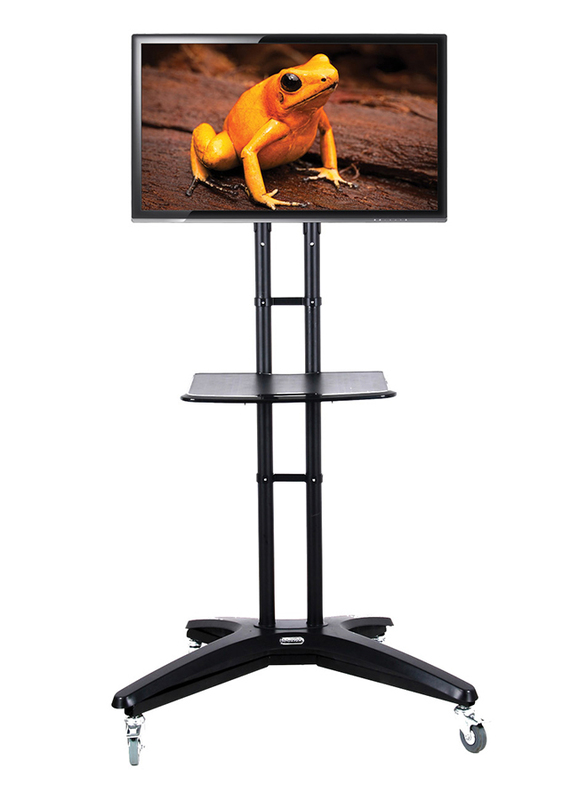 For more information about our range of monitor stands, please contact us or call us on 01733 511030.